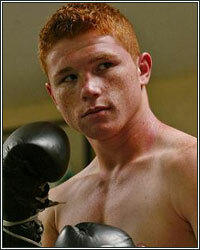 REDHEADED FURY: WHAT'S NEXT FOR SAUL ALVAREZ? Last night, in front of a packed house in Guadalajara, Mexico, the redheaded boxing phenom Saul "Canelo" Alvarez once again impressed the boxing world with his grinding demolition and eventual 12th round stoppage of the cagey veteran fighter Ryan Rhoades. Not only did Canelo prove last night that he is not just some kid with a pretty face and a lot of media attention, he easily and soundly outclassed Rhodes with a true boxing performance. Throughout the fight, he showed good ring generalship and landed the bigger, harder punches, all the while not taking too much punishment himself. He showed improved head movement and defensive skills over some of his past performances, and to put the icing on the cake, he also destroyed an accomplished Rhodes with much style and class. There was never a moment in the fight where he lacked poise or acted like he didn't know what to do. It's clear that Saul Alvarez is taking his career seriously and is improving his game, which makes him an even bigger threat to future opponents. Throughout the night, Alvarez stalked Rhodes, who one must give due credit to for slipping, and taking, a lot of punches. Rhodes tried switching stances, offensive attacks, and counter punching tactics, but all of that efforts fell short of the goal of stopping the onslaught of Alvarez. On the other hand, Alvarez was timing Rhodes and landing big shots at will. He was throwing fast, hard combinations to the body and head that seemed to literally beat the veteran Rhodes into submission. In the end, it was Canelo's body punching that was the difference maker in the fight. After the fight, Ryan Rhodes said, "His body shots were fantastic. They took a lot out of me. He really caught me with some good body shots." He also made it clear that he felt no shame in losing to a guy like Alvarez, stating, "I've been beaten up by a super star of boxing tonight." This performance only left one lingering unanswered question...what is next for Saul Alvarez? After the fight, during the post-fight interview, Alvarez was asked about fighters such as Miguel Cotto, Alfredo Angulo (who is ranked #2 at 154 by the WBC and was ringside for the fight), and Julio Cesar Chavez Jr. When asked who was next, he simply stated, "I'm ready for anybody." He put an exclamation point at the end of that statement by adding, "If I have to fight the devil, I'll fight the devil." One could think those are bold words for such a young fighter, but after last night's performance, one must also believe he is definitely among the best at 154. Another couple of names that I believe definitely should be mentioned are Vanes Martirosyan and Paul Williams, who along with Alfredo Angulo are respectively ranked the #1, #2, and #4 contenders by the WBC. If Canelo doesn't chase a super fight and defends his title the old fashioned way, he will be stepping up to yet another challenge in the undefeated up-and-comer Vanes Martirosyan, who is the WBC mandatory challenger. Either way, we can expect a good fight and solid performance after what we saw on Saturday night.